Ramadhan Buffet " Selera Aneka Rasa" @ Kelab Rahman Putra Malaysia! 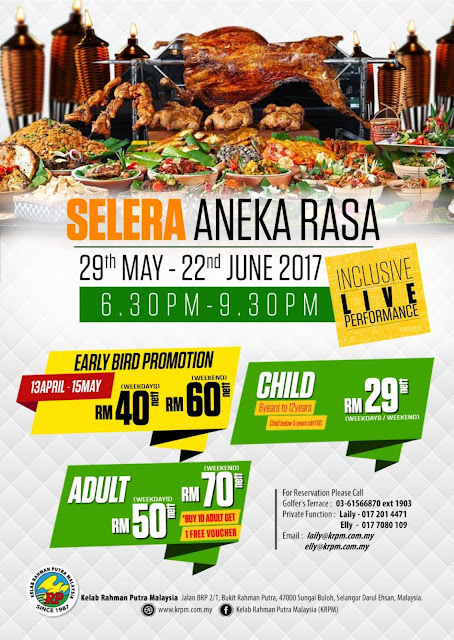 Get your Early Bird Vouchers today! Over 70+ mouth watering delicacies served! Don't miss out this opportunity to treat your loved ones and friends! Live band perfomances everyday! Give us a call and get your early bird vouchers now! Priced at Rm40 for weekdays and Rm60 for weekends! It doesn't get any better than this! Spread the news!